LOOKING FOR 1980S SEVENTEEN MAGAZINE RECIPES? JOIN THE PARTY AND REQUEST HERE! Blame it on Seventeen magazine circa 1980s. Amid the legwarmers, scrunchies and plaid suspenders lurked a monthly food feature called Now You’re Cooking. Groan-inducing, goody-goody headers (“Wok With a Friend”) gave way to surprisingly worthy recipes for family dinners or dreamy party plans for the gang. A recipe hoarder was born. This is really less of a cooking blog and more of an electronic recipe collection. It is helping rid me of an awkward binder stuffed with decaying clippings. Since I began posting these retro recipe pages, something fun is happening: a little community is sprouting up. Those recipes were made for families and friends decades ago and they hold a lot of nostalgia. I am always searching for lost Seventeen Magazine recipes from the ’80s, and a lot of you are, too. Feel free to ask and to share if you are a collector as well. I love these Seventeen tecipes and have lots!! Would you swap or sharr? I have the Seventeen recipe for Chicken Cordon Bleu (without the ham) if you have not found it yet. Trena! Thanks for finding me and thanks for the recipe offer. I would love that one! Are there any you are searching for? Would be happy to help. Saucy, I have three originals: Chicken Cordon Bleu (with ham) Seafood Chowder and Lasagna Rolls. I will email them to you if I can find your email address. Thanks! In searching the web for a Seventeen mag recipe (so that I could pin it), I found reference to a search for the original recipe here on your site. I have the article “How to bake a Monster Cookie” from Seventeen from August 1977. It was in my middle school cooking class folder of recipes! I can scan it in if you’d like to have a copy. Wow, Amy to the rescue! There are scores of people who would love that! I am happy to post it here at long last, thanks! Can we help you find any recipes? Did you get the Giant Oreo Cookie recipe, yet, because I FINALLY got it and will share!! :) Let me know! Hi Mary! Please so share! Thank you for following up! Melt chocolate chips in microwave. Set aside. Combine shortening, 1/2c sugar and egg. Beat until creamy; mix in corn syrup and melted chocolate. Blend in flour, soda, cinnamon and salt. Shape into 2 equal balls and roll in remaining sugar. Bake 350 degrees for 25 minutes. Will be soft, but will set. Do not over bake. Cream butter with peppermint extract. Add powdered sugar. Stir in milk. **I haven’t actually made this yet, but had it once when my husband brought some home from work. His coworker said it was from an old seventeen magazine:) I remembered it because I have made the peanutbutter temptations and cream cheese cut-outs from that issue for years! Enjoy! Really glad I found this site! 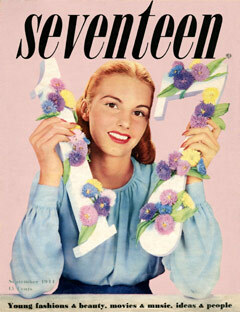 I’ve been trying to find the recipe for a dense brownie with icing from Seventeen magazine in the early or mid 1980’s. It might have been with recipes for Valentine’s day. Thank you very much! Hi Angela, we’ll try to help. The only brownie recipe I have from then is a brownie layered with strawberry ice cream. Do you remember anything else about the recipe? Let’s see if our sleuths can help! Hi! I have a memory of a 1980’s recipe in Seventeen that showed an ice cream watermelon bombe and some kind of gelatin (apricot) set in a cantaloupe rind? I’m thinking it’s from either 1980 or 1986 or later? Does this ring any bells? I have tons of back issues hoarded, let me know if there is anything I can help you find! Thanks! Hi Gayden! We’d love to share some summer recipes from your collection. Can you scan and email us for posting? Thank you, thank you, thank you. I just found you today and all these great things from when I first started cooking at 11 (’81). I have the hearty hero sandwich roll recipe at home, but no pics. This is the one that can also be turned into a cinnamon roll. Hi Pam. This recipe says it’s from Seventeen 1983 Don’t have the page but would love to share if someone does! Brenda, don’t have that page but will ask around! I would love to find the recipe for banana chocolate chip muffins from the 80’s. I remember them being different because you just chop the bananas instead of mashing them! They were so good. Mary Haynes: We’ve seen that issue on ebay. Hopefully someone can help! Hello 🙂 I am looking for 80s Seventeen magazine’s Jambalaya and sole filets baked in a cucmber-milk sauce. Please help me find them. Thank you. I’m looking for a St. Patrick’s Day recipe that was corned beef and cabbage in a pastry roll. It was about as long as a cookie sheet. Hi Kim, thanks for the recipe request! Is that from the 1960s or ’70s? Do not recall that from the 1980 pages but sounds interesting. Can anyone help Kim? I am so excited to have found this blog! I have saved a few of “Now You’re Cooking” recipes, but I can’t find one that was SO good… it was a cornish hen recipe stuffed with wild rice and had a honey and something glaze. I made it for my parents when I was in high school and knew it was a keeper, but I can’t find it anywhere. Does anyone have a copy of this one? I would LOVE to make this recipe again. Hi! I think I have seen that recipe, will take a look. Can you share your pages? We’d love to share! Hi, I’m looking for a Seventeen Magazine recipe from around 1981 for Hamburger Pie. It uses cream of mushroom soup, mashed potatoes and cheese on top of a hamburger pie shell. Thanks! I am looking for a Seventeen Magazine recipe – I think it might be a Holiday Season recipe – from somewhere between 1978-81 (I think) for Chocolate German Forest Cake. I think it was three layers, with meringue in between. Any help greatly appreciated!